Mosaic Personnel is an Oklahoma City based recruiting firm that specializes in placing people of character and competence for careers in Accounting, Administrative, Engineering, Human Resources, IT, and Manufacturing. Our proven recruiters place great people in the right opportunities. Is a bad resumé keeping you from a good job? 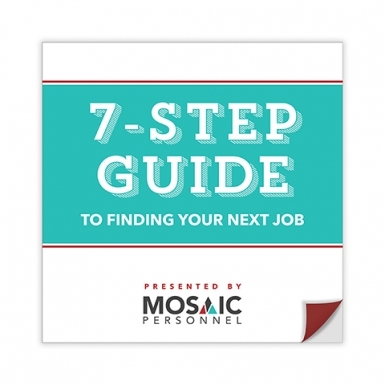 Download our 7-Step Guide to Finding Your Next Job to gain valuable insight on interview preparation and creating a rock-solid resumé—directly from our team of experienced recruiters. By supplying your email you are consenting to receive occasional marketing emails by Mosaic Personnel. Your data is only used to contact you regarding things of interest and will not be sold to any third parties.